No matter how you feel about zoos, this story will make you feel good. Zoo administrators are always experimenting with ways to make their animals’ caged experiences as accommodating to their needs as possible, with varying degrees of success. But thanks to an innovative and humane new initiative, one of our most beloved institutions is setting a new standard for animal rights. The San Diego Zoo has taped telescopes to all of their animals’ heads so that they can look at the planets. What a tremendous step forward! For decades, the San Diego Zoo led the way in terms of tourist attractions, but this latest move proves that they are even more committed to treating their animals with dignity. 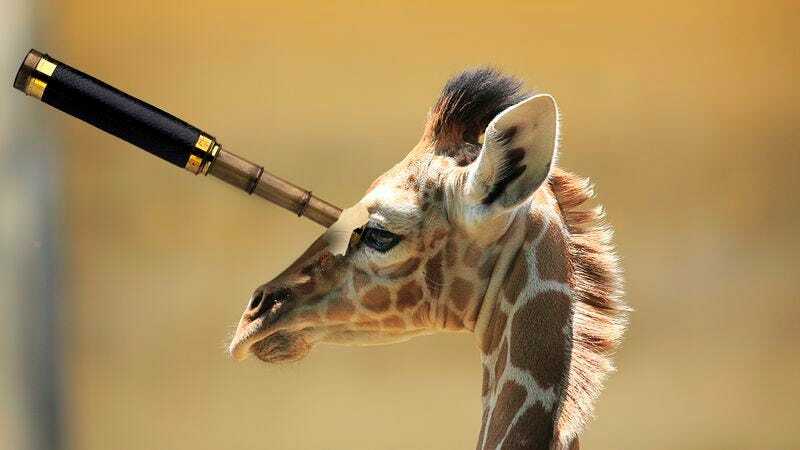 With a telescope affixed to each animal’s head, these incredible creatures can now gaze at the planets just by looking up. Visitors can take great comfort knowing that the ostriches, chinchillas, and all other animals are no longer limited to just looking at trees, dirt, or clouds, as they had been for so many heartbreaking years. According to president and CEO Douglas Myers, the project directly addresses a basic right of all animals. Indeed, most zoo animals have never had the ability to take in the wonders of our galaxy, but in San Diego it’s now a key part of every animal’s care plan. At any moment, an otter can swivel his head and take a look at Saturn. A zebra can glance up from grazing to observe a sea of constellations seemingly close enough to lick. And when the park welcomed a new fox last month, tourists were able to watch as zoologists strapped a tiny telescope to his head, equipped with a polarized filter to protect his sensitive eyes. Well, if you needed another reason to finally visit the San Diego Zoo, you’ve officially got it. Hopefully, this will encourage zoos everywhere to continue to explore new ways to address the welfare of their animals. Thankfully, they now have an excellent place to start.